The suspects entered each location in a similar manner. Suspect #1 entered the targeted business, pointed a shotgun at the clerk and demanded cash while Suspect #2 took cash from the register. Suspect #1 is described as a black male adult standing 6' tall and weighing about 175 pounds with an athletic build. Suspect #2 is described as a black male adult standing about 5’9”. The suspects should be considered armed and dangerous. If you see them, please call 911. If you recognize the suspect or have information about any of these crimes, call the San Diego County Sheriff’s Department at (858) 565-5200 or the Crime Stoppers anonymous tip line at (888) 580-8477. Please visit www.sdcrimestoppers.org for information on how to send a web or cell phone tip. Crime Stoppers is offering up to a $1,000 reward to anyone with information that leads to an arrest in these cases. Media inquiries about this case can be directed to Sheriff’s Detective Kyle Berchin at (619) 660-7087 or kyle.berchin@sdsheriff.org. Media inquiries about Crime Stoppers can be directed to Deputy Adriana Uribe at (619) 531-1547 or adriana.uribe@sdsheriff.org. San Diego County Crime Stoppers and investigators from the San Diego Police Department’s Northeastern and Eastern Divisions, along with investigators from the La Mesa Police Department, are asking for the public’s help in identifying and locating three suspects who are wanted for a series of residential burglaries. On August 13, 2017, at approximately 3:30 p.m., an unknown female rang the doorbell of a residence located in the 6300 block of Glenmont Street, in the Del Cerro area of San Diego. No one answered the front door. Two unknown males broke a rear sliding glass door, entered the home, and stole several items. Later that same day, at 4:30 p.m., the same female rang the doorbell of a residence located in the 5700 block of Jackson Drive, in La Mesa. The female asked the homeowner if “Tony” lived there. The homeowner told the female that she had the wrong house. The homeowner left the house and returned several hours later to discover his rear sliding glass door was shattered and three bedrooms had been ransacked. The suspects stole over $7,600 worth of jewelry and miscellaneous items. On August 29, 2017, at approximately 10:00 a.m., the same female and two males burglarized a residence in the 13000 block of Calderon Road in the Rancho Penasquitos area of San Diego. The suspects gained entry into the house by breaking a rear sliding glass door. The suspects stole numerous high end purses totaling over $10,000 in value. The female suspect is described as Asian, in her 20’s, thin build, wears large black frame glasses, long bright green painted fingernails, and has a tattoo on her left forearm. Both male suspects are described as being Black, in their 20’s, approximately 5’8” tall, and had thin builds. The suspects are seen using a black Chrysler 200 with paper plates. The suspects may also be using a four-door white Mercedes. Anyone with information on the identity or location of the suspects is asked to call the Crime Stoppers anonymous tip line at (888) 580-8477. Please visit www.sdcrimestoppers.org for information on how to send a web or cell phone app tip. Crime Stoppers is offering up to a $1,000 reward to anyone with information that leads to an arrest in this case. Investigators from the San Diego Police Department’s Robbery Unit are asking for the public’s help in identifying and locating two unknown suspects wanted for a commercial armed robbery of a Shell gas station located in the Carmel Valley area of San Diego. On October 25, 2017, at 11:16 p.m., an unknown adult male suspect (S-1) approached the clerk at the Shell gas station located at 3861 Valley Centre Drive, in San Diego. S-1 asked the clerk if he could use the restroom. The clerk told S-1 he could. S-1 later walked out of the restroom armed with a silver colored machete and was wearing a mask over his face. S-1 demanded all the money in the cash register. The clerk complied. S-1 was last seen running westbound away from the gas station. The clerk noticed a White female (S-2) driving a gold colored pickup truck towards S-1 as he was running away. S-1 is described as a White male, late 20’s to mid-30’s, 5’7” to 5’8” tall, medium build, wearing a black hooded sweatshirt with a white California bear on the front, blue jeans, dark grey or blue colored baseball cap with “Ford” on the front of it, blue Keds shoes, green backpack, and had a wraparound band style tattoo on his left arm. S-2 is described as a White female, in her 40’s, medium build, long dark colored hair, wearing a black shirt and black pants. The suspects’ vehicle is described as a gold colored Toyota Tacoma with an extended cab. Anyone with information on the identity or location of the suspects is asked to call the SDPD’s Robbery Unit at (619) 531-2299 or the Crime Stoppers anonymous tip line at (888) 580-8477. Crime Stoppers is offering up to a $1,000 reward to anyone with information that leads to an arrest in this case. Visit the Crime Stoppers website at www.sdcrimestoppers.org for more information on how to send anonymous web and mobile app tips. San Diego County Crime Stoppers along with investigators from the San Diego County Sheriff’s Department’s Poway Station are asking for the public’s help in identifying and locating an unknown suspect wanted for robbery. On September 12, 2017, at noon, an unknown suspect forcefully took a purse that was on the shoulder of a 75-year-old female victim while she was walking in the parking lot of Walmart located at 13425 Community Road, in Poway. The suspect fled the area riding a skateboard. Anyone with information on the identity or location of the suspect is asked to call the Sheriff’s Poway Station at (858) 513-2800 or the Crime Stoppers anonymous tip line at (888) 580-8477. Crime Stoppers is offering up to a $1,000 reward to anyone with information that leads to an arrest in this case. Information on how to send anonymous emails and mobile app tips can be found on our website www.sdcrimestoppers.org. Media inquiries about this case can be directed to Detective Crews at (858) 513-2840. Media inquiries about Crime Stoppers can be directed to Officer Mark Herring at (619) 531-1500 or email at msherring@pd.sandiego.gov. San Diego County Crime Stoppers along with investigators from the San Diego Police Department’s Robbery Unit are asking for the public’s help in identifying and locating an unknown suspect wanted for a commercial armed robbery of a GameStop store located in the Lake Murray area of San Diego. On August 15, 2017, at 5:26 p.m., an unknown adult male suspect entered the GameStop store located at 8898 Navajo Road, in San Diego. The suspect removed a handgun from his waistband and pointed it towards the two clerks who were behind the counter. The suspect placed a black bag on the counter and demanded money from the cash register. The clerks complied. The suspect left the store and was seen getting into a blue or white four door car and driving away on Navajo Road. The suspect is described as a White male, 40 to 50-years-old, 5’7” to 5’8” tall, 200 to 250 lbs., wearing a dark red colored wig underneath a black baseball hat, grey sweatshirt, blue jeans, and black gloves. Media inquiries about this case can be directed to SDPD Robbery Lt. Eric Hays at (619) 533-5752 or email at ehays@pd.sandiego.gov. San Diego County Crime Stoppers along with investigators from the San Diego Police Department’s Robbery Unit are asking for the public’s help in identifying and locating two unknown suspects wanted for a commercial armed robbery of a Quality Inn located in the San Ysidro area of San Diego. On July 25, 2017, at 11:25 p.m., two unknown suspects ran into the front desk area of the Quality Inn located at 930 W. San Ysidro Boulevard. Suspect # 1 (S-1) pointed a handgun at both clerks and walked around the front counter while suspect # 2 (S-2) jumped over the front counter. S-1 demanded money from the cash register and both clerks’ wallets. The clerks complied. S-1 also took a backpack belonging to one of the clerks. Both suspects ran outside and got into a light colored Toyota Corolla and were last seen driving eastbound on W. San Ysidro Boulevard towards the Interstate 5 northbound on-ramp. Described as a White male, 20 to 30-years-old, 6’0” tall, 150 lbs., wearing a plain blue baseball cap, grey gloves, black jacket, grey shirt, blue jeans, and had a light colored mask covering the upper portion of his face. S-1 was armed with a silver colored semi auto handgun. Described as possibly a Hispanic or light skin Black male, 20 to 30-years-old, wearing a black t-shirt with a picture of a pit bull on the front of it, blue jeans, blue gloves, and had a monkey animal mask covering his face. Described as a light colored 1998-2002 Toyota Corolla. San Diego County Crime Stoppers along with investigators from the North Coastal Sheriff's Station are asking for the public’s help in identifying and locating two suspects wanted for a commercial armed robbery that occurred in Encinitas. On Tuesday, July 25, 2017, at about 5:30 a.m., two men entered the Shell gas station, located at 865 Orpheus Avenue in Encinitas. The store clerk had just left the register area to go into the stockroom. Suspect #1 ran behind the counter and grabbed the register with an undisclosed amount of money. Suspect #2 had a shotgun and pointed it at the clerk as he was walking out of the stockroom. Both suspects left the gas station in an unknown direction. Suspect #1 is described as a White male in his 30’s, standing about 6’1” tall and weighing approximately 200 lbs. He has short brown hair and was last seen wearing a black bandana, tan jacket, black jeans, and black Converse tennis shoes. Suspect #2 is described as a White male in his 30’s, standing about 5’10” tall and weighing approximately 190lbs. He has a shaved head and was last seen wearing a black ski mask, tan khaki pants, and white Converse tennis shoes. Suspect #2 was seen holding a shotgun with either a red handle or a red bandana wrapped around the handle. Anyone with information on the identity or location of the suspects is asked to call the North Coastal Sheriff's Station at (760) 966-3500 or the Crime Stoppers anonymous tip line at (888) 580-8477. Crime Stoppers is offering up to a $1,000 reward to anyone with information that leads to an arrest in this case. Information on how to send anonymous emails and mobile app tips can be found on our website: www.sdcrimestoppers.org. San Diego County Crime Stoppers and investigators from the San Diego Police Department’s Robbery Unit are asking for the public’s help in identifying and locating unknown suspects wanted for a robbery that occurred at a home in Mira Mesa. On July 1, 2017, there was a party at a home located in the 7000 block of Embry Point, in Mira Mesa. Approximately 80 to 100 people attended the party; some were invited guest and others were not. The host of the party received a first response notice from the police. Shortly after the police left, the host ended the party and asked everyone to leave. A lot of new people showed up as the party was winding down. The host tried stopping an unknown group of four to six Black males from going into the home. A fight ensued that ultimately ended up inside the house. The host was beaten up and his wallet and iPhone were taken from him. The suspects left the house and got into two separate vehicles. One of the vehicles is believed to be a white Mazda 3. This vehicle was driven by an unknown race female and collided with a parked car on Embry Way before fleeing the scene. Four to six Black males in their 20s. Two of the suspects had dreadlocks. Vehicle Description: One of the vehicles was described as being a white Mazda 3. Pictures of this vehicle can be seen on Page 2 of the release. $1,000 reward to anyone with information that leads to an arrest in this case. For information on how to send anonymous web tips and mobile tips please visit our website at www.sdcrimestoppers.org. San Diego County Crime Stoppers along with investigators from the San Diego Police Department’s Robbery Unit are asking for the public’s help in identifying and locating an unknown suspect wanted for two commercial armed robberies. On June 23, 2017, at 9:20 a.m., an unknown adult male suspect walked into the Subway restaurant located at 2015 Garnet Avenue, in San Diego. The suspect removed a handgun from his waistband and pointed it at the employee while demanding money from the cash register. The suspect gave the employee a black bag and demanded the cash be placed inside the bag. The employee complied. The suspect walked out of the restaurant and left the area in an unknown direction. Later that same day, at 3:50 p.m., the same suspect robbed the Subway restaurant located at 2907 Shelter Island Drive, in San Diego. The suspect is described as a White male, 20 to 30-years-old, 5’10” to 6’0” tall, 150 to 200 lbs., thin build, wearing a black and grey baseball cap, pullover sweatshirt with the letters “SD” on the chest, dark pants, with a black, blue, and white colored bandana covering his face. The suspect was carrying a black bag with a green stripe on it and was armed with a black semi-auto handgun. Anyone with information on the identity or location of the suspect is asked to call the SDPD’s Robbery Unit at (619) 531-2299 or the Crime Stoppers anonymous tip line at (888) 580-8477. Crime Stoppers is offering up to a $1,000 reward to anyone with information that leads to an arrest in this case. Anonymous emails can be sent via www.sdcrimestoppers.org. San Diego County Crime Stoppers and investigators from the San Diego Police Department’s Central Division are asking for the public’s help in identifying and locating unknown suspect(s) wanted for a robbery in the Gaslamp area. On March 31, 2017, at about 2:25 a.m., an adult male victim was inside the Subway restaurant located at 950 5th Avenue, in San Diego. While inside the restaurant, the victim was speaking with a group of males whom he did not know. The victim walked out of the restaurant and headed northbound on 5th Avenue. Shortly after walking out of the restaurant, the victim was punched once in his head rendering him unconscious. The suspect(s) stole the victim’s cell phone, watch, shoes, and cash. The victim suffered several abrasions to his face and head. The victim was transported to a local hospital where he was treated for major head trauma including a brain bleed. A witness described seeing two Black males punching and kicking the victim while he was on the ground. The witness stated that both males were last seen running southbound on 5th Avenue. Investigators are hoping to identify four persons of interest in this case. They are not considered suspects at this time, but were seen speaking to the victim just prior to the robbery. Friends and family of the victim are offering $9,000 in addition to Crime Stoppers up to $1,000 reward for information that leads to an arrest in this case. Anyone with information on the identity or location of the persons of interest is asked to call the SDPD’s Central Division at (619) 744-9500 or the Crime Stoppers anonymous tip line at (888) 580-8477. Crime Stoppers is offering up to a $1,000 reward to anyone with information that leads to an arrest in this case. Friends and family of the victim are offering an additional $9,000 for information that leads to an arrest in this case. Anonymous email tips can be sent via www.sdcrimestoppers.org. Media inquiries about this case can be directed to A/Detective Jose Conde at (619) 744-9518 or email at jconde@pd.sandiego.gov. 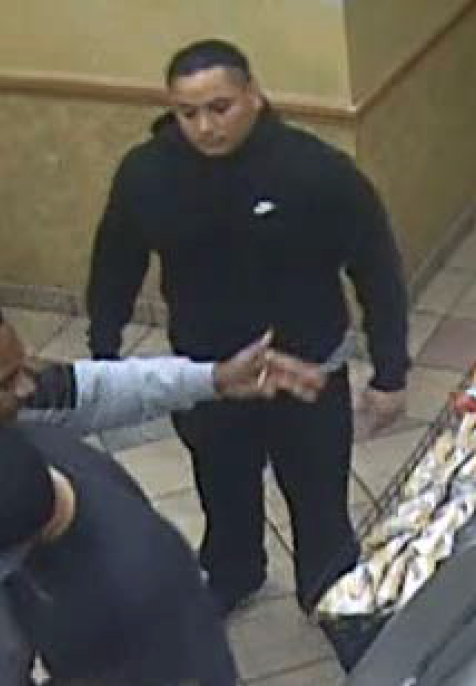 On March 31, 2017, at about 2:25 a.m., an adult male victim was inside the Subway restaurant located at 950 5th Avenue, in San Diego. While inside the restaurant, the victim was speaking with a group of males whom he did not know. The victim walked out of the restaurant and headed northbound on 5th Avenue. Shortly after walking out of the restaurant, the victim was punched once in his head rendering him unconscious. The suspect(s) stole the victim’s cell phone, watch, shoes, and cash. The victim suffered several abrasions to his face and head. The victim was transported to a local hospital where he was treated for a brain bleed. Anyone with information on the identity or location of the persons of interest is asked to call the SDPD’s Central Division at (619) 744-9500 or the Crime Stoppers anonymous tip line at (888) 580-8477. Crime Stoppers is offering up to a $1,000 reward to anyone with information that leads to an arrest in this case. Anonymous email and text messages can be sent via www.sdcrimestoppers.org. Media inquiries about this case can be directed to Detective Sergeant Dean Thomas at (619) 744-9505 or email at dmthomas@pd.sandiego.gov. Department’s Robbery Unit and Rancho San Diego Sheriff’s Station are asking for the public’s help in identifying and locating two unknown suspects wanted for commercial armed robberies in the City of San Diego and Spring Valley. This series includes 3 separate cases; however investigators are looking at other cases countywide to see if they are related. Case # 1 On April 6, 2017, at 9:25 p.m., an unknown adult male suspect (S-1) walked into the Market at the Ranch gas station and liquor store located at 10299 Scripps Trail, in San Diego. The suspect was armed with a black and silver colored handgun in his right hand and demanded the clerk open the cash register. The clerk attempted to open the register but was having difficulty. The suspect was upset over the delay in opening the register and fired a round into the cigarette display case along the wall. The suspect then struck the clerk in the eye with the gun. The clerk was eventually able to open the register and placed an undisclosed amount of cash into a black plastic bag that the suspect brought with him. The suspect then demanded the clerk open the safe. The clerk told the suspect he did not have the key to open the safe. The suspect fired another round off. The suspect again struck the clerk in the eye with the gun and also kicked the clerk. The suspect left the store and possibly got into a smaller silver colored SUV and fled the area. The clerk sustained minor injuries to his face. S-1 is described as a Black male, 5’7” to 6’0” tall, 165 lbs, with a mustache. The suspect was wearing blue jeans, a black colored hooded sweatshirt and grey gloves. S-1’s Vehicle is possibly a smaller silver colored SUV. Case # 2 On April 19, 2017, 2:55 a.m., an unknown adult male suspect (S-1) entered the 7 Eleven located at 9365 Jamacha Boulevard, in Spring Valley. S-1 was armed with a handgun and chambered a round as he approached the clerk. S-1 demanded money from the clerk as he struck the clerk in the face with the handgun. S-1 demanded the clerk place money inside a plastic bag and then struck the clerk a second time in the face with the handgun. S-1 struck the clerk in the face two more times with the handgun and fired a round into the ceiling during the robbery. S-1 was described as a Light skinned Black male, wearing a red and black hooded sweater with a white deign (possibly a tag) on the upper back, and black pants. Case # 3 On April 20, 2017, at 9:00 p.m., two unknown suspects walk into the Apollo Market located at 2327 Reo Drive, in San Diego. S-1 was armed with a black and silver colored handgun. S-1 chambered a round in the gun and pointed it at both clerks while demanding they open the cash register. One of the two clerks ran towards the back of the store in fear of his life. The second suspect (S-2) walked into the store. S-1 walked behind the counter and attempted to open the cash register, but was unsuccessful. S-1 again pointed the gun at the clerk and demanded money. S-2 also demanded cash from the clerk. The clerk did not comply. Both suspects left the store without any money. S-1 is described as a Black male in his 20’s, medium to stalky build, wearing a dark blue hooded jacket with the hood drawn tight around his face, red rag or bandana on his face, black pants and black shoes. S-2 is described as Black male, unknown age, about 5’6” tall, thin build, wearing a black hooded jacket with the hood drawn tight around his face, blue jeans with rips in them, and black over white tennis shoes. Anyone with information on the identity or location of the suspect is asked to call the SDPD’s Robbery Unit at (619) 531-2299 or the Crime Stoppers anonymous tip line at (888) 580-8477. Crime Stoppers is offering up to a $1,000 reward to anyone with information that leads to an arrest in this case. Anonymous email and text messages can be sent via www.sdcrimestoppers.org. Media inquiries about Cases # 1 and 3 can be directed to SDPD Robbery Sgt Bill Albrektsen at (619) 531-2661 or email at walbrektsen@pd.sandiego.gov. Media inquiries about Case # 2 can be directed to Rancho San Diego Sheriff’s Station, Sgt Karla Menzies at (619) 660-7056 or email at karla.menzies@sdsheriff.org. Robert Gary Vinck is wanted by the California Department of Corrections and Rehabilitation along with the Chula Vista Police Department for an outstanding felony warrant ($ 200,000 bail) for auto theft, possession of stolen property, assault on a peace officer, and DUI. Vinck is also a parolee at large. Vinck is considered armed and dangerous. Vinck has previous convictions for robbery, auto theft, possession of stolen property, credit card fraud, and DUI. Vinck is currently on parole for first degree robbery. April 13, 2017 San Diego County Crime Stoppers along with investigators from the San Diego Police Department’s Robbery Unit are asking for the public’s help in identifying and locating an unknown suspect wanted for assault with a deadly weapon and commercial armed robbery in the Scripps Ranch area. On April 6, 2017, at 9:25 p.m., an unknown adult male suspect walked into the Market at the Ranch gas station and liquor store located at 10299 Scripps Trail, in San Diego. The suspect was armed with a black and silver colored handgun in his right hand and demanded the clerk open the cash register. The clerk attempted to open the register but was having difficulty. The suspect was upset over the delay in opening the register and fired a round into the cigarette display case along the wall. The suspect then struck the clerk in the eye with the gun. The clerk was eventually able to open the register and placed an undisclosed amount of cash into a black plastic bag that the suspect brought with him. Suspect’s Description: is described as a Black male, 5’7” to 6’0” tall, 165 lbs, with a mustache. The suspect was wearing blue jeans, a black colored hooded sweatshirt and grey gloves. Suspects’ Vehicle is possibly a smaller silver colored SUV. Anyone with information on the identity or location of the suspect is asked to call the SDPD’s Robbery Unit at (619) 531-2299 or the Crime Stoppers anonymous tip line at (888) 580-8477. Crime Stoppers is offering up to a $1,000 reward to anyone with information that leads to an arrest in this case. Anonymous email and text messages can be sent via www.sdcrimestoppers.org. an Diego County Crime Stoppers and investigators from the Santee Sheriff’s Station are asking for the public's help to locate an unknown suspect wanted in connection with multiple robberies and assault with a deadly weapon. On February 28, 2017 at approximately 12:40 pm, a White male subject concealed a camera from Best Buy located at 8401 Fletcher Parkway, La Mesa. When confronted by Loss Prevention the suspect pulled out a hatchet and said, “Want to get hit with a hatchet.” The suspect then fled in a brown four door Buick. On March 12, 2017 at about 00:10 am, an unknown White male adult took multiple items from the Walmart store located at 13487 Camino Canada in unincorporated El Cajon. As the male exited the store he drew what appeared to be a black Glock style handgun from his waistband, pointed it at a manager and stated, "Do you want to do this the hard way or the easy way." The suspect walked around the manager towards the exit doors where he fired the gun several times at him. The gun was believed to be a CO2 type BB handgun. The suspect fled in an older model silver Buick type vehicle. At least two stolen items were identified as BB gun rifles. On March 12, 2017 at about 11:00 pm, an unknown White male entered the Wal-Mart located at 170 Town Center Parkway in Santee. The male attempted to flee the store when he was confronted by the Assistant Manager. While attempting to leave, the male took out a BB gun from his backpack and fired multiple BB rounds at the assistant manager. The BB rounds missed the manager but hit a different employee in the shoulder. The employee sustained no injuries from the BB gun. The unknown male exited the store and fled the scene in his vehicle which was described as a brown sedan. The unknown male left a wallet inside the shopping cart he was using to select items with which belonged to a victim of identity theft. The victim's credit cards were later used at three places in the City of San Diego. San Diego County Crime Stoppers along with investigators from the San Diego Police Department’s Robbery Unit and Escondido’s Crimes of Violence Unit are asking for the public’s help in identifying and locating two unknown suspects wanted for a series of commercial armed robberies targeting convenience stores. On February 6th and 9th, 2017, there were a total of 4 separate armed robberies to convenience stores in both San Diego and Escondido. Investigators believe these cases are related. The suspects entered the businesses armed with shotguns and or a pistol and demanded money from the clerk. The suspects placed the money into backpacks they brought with them. The suspects were seen fleeing the businesses in a black colored four door sedan. Suspect # 1 is described as a Hispanic male, 20 to 30-years-old, 5’8” to 6’0” tall, 150 to 180 lbs, medium build, dark hair, brown eyes, mustache, wearing dark clothing, a black mask, and red gloves. Suspect # 2 is described as a Hispanic male, 20-years-old, 5’6” to 5’8” tall, 150 to 180 lbs, wearing black pants, black hooded sweatshirt with a red and black logo on the left chest and white draw strings attached to the hood, black mask, black baseball cap, black shoes with white soles, and black gloves. Suspects’ Vehicle is described as a black colored four door sedan. Anyone with information on the identity or location of the suspects is asked to call the SDPD’s Robbery Unit at (619) 531-2299 or the Crime Stoppers anonymous tip line at (888) 580-8477. Crime Stoppers is offering up to a $1,000 reward to anyone with information that leads to an arrest in this case. Anonymous email and text messages can be sent via www.sdcrimestoppers.org. • Media inquiries about this case can be directed to SDPD Robbery Lt. Eric Hays at (619) 533-5752 or email at ehays@pd.sandiego.gov. • Media inquiries about Crime Stoppers can be directed to Officer Mark Herring at (619) 531-1500 or email at msherring@pd.sandiego.gov. Larry Jones is wanted by the San Diego Fugitive Task Force for an outstanding felony warrant ($150,000) for robbery and assault with a deadly weapon. Jones has previous convictions for felony battery, parole violation, assault with a deadly weapon, felony evading, and for possession and transportation of a controlled substance. Jones is known to frequent Southeast San Diego and specifically the Skyline Neighborhood.